Joe "Chik" Porrazzo is the Founder and President of Warrior Passion. Chik is a retired Marine F/A-18 Pilot and has served in both Operation Iraqi Freedom in Iraq and Operation Enduring Freedom in Afghanistan. Chik enjoys sharing his passion of flying by donating flights in his own airplane, an aerobatic Super Decathlon. He is also an avid scuba diver, golfer, musician, and enjoys a multitude of other sports and hobbies. Chik believes that adrenaline is like fuel for the soul, and that we all need a fill up every now and then! Chris "Kitty" Collins is a founding member of Warrior Passion. 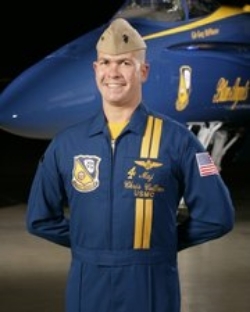 Kitty is currently and Active Duty Marine F/A-18 Pilot and former Blue Angel Pilot. Kitty has flown hundreds of combat missions in the F/A-18, but he also enjoys flying small airplanes in his off time as well. He is currently building his own experimental airplane called a Velocity XL. Kitty enjoys many sports and hobbies and is excited to share them with our Nation's Wounded Heroes! John Stevens is a retired Marine Artillery Officer and a founding member of Warrior Passion. John has served in combat operations around the globe on several deployments. John is looking forward to continuing a life of service by sharing his passions with our Wounded Vets. Legal disclaimer regarding the use of airplanes: Warrior Passion is financially supported by our pilots who fly the missions by donating the use of their airplanes and operating expenses. Warrior Passion volunteer pilots receive no financial compensation from any entity or individual for flights. Pilots and/or their aircraft who volunteer with Warrior Passion are NOT available for hire. There is never a fee of any kind charged to the passenger. All associated flight costs are paid by the volunteer pilots.